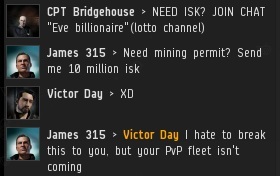 Previously, on MinerBumping... Victor Day of Fidelas Constans, a CFC alliance, became furious at me for bumping his mining ship. 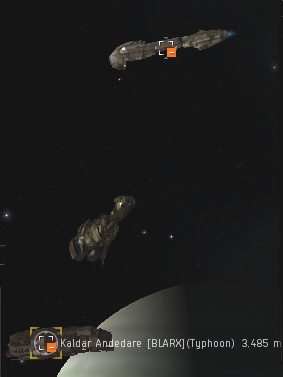 He threatened to summon a PvP fleet from Fountain to avenge his lost bumping cycles. 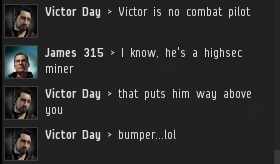 As time went by and no PvP fleet appeared, I must confess that I grew skeptical of Victor's claims. Notorious wardeccer Cannibal Kane passed through the system. His voice added to the chorus of doubters. 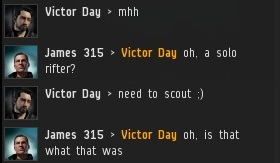 Victor Day's credibility as a secret nullsec powerbroker began to erode. Eager to salvage the situation, and with no backup in sight, Victor descended to the lowest depths of carebeardom: He attempted to counter-bump me with a frigate. After trying and failing to counter-bump me, Victor retreated to the station. He tried to play it off casually. Though he had attempted to thwart me by using the bumping mechanic only a few moments before, Victor was cynical. He no longer respected bumpers. I warped by an asteroid belt near Kamio VI and nearly missed seeing an odd sight. Returning, I confirmed the anomaly. Despite its questionable Minmatar architecture, I could see that it was indeed a battleship, not an asteroid. I gave the Typhoon a friendly bump. It was piloted by Kaldar Andedare. A few weeks earlier, he and Jennifer en Marland had lost 100 million isk during a failed attempt to assassinate me using a Caracal, a Brutix, and some Catalysts. 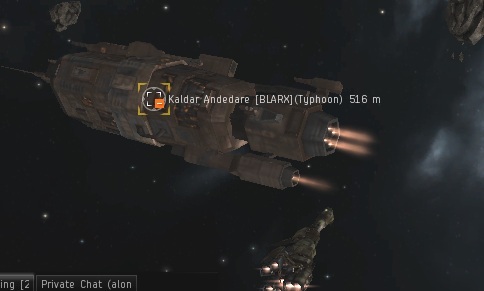 I became fascinated by the possibility that Kaldar might try to suicide gank me with a Typhoon. Because Concorded ships receive no insurance payouts, the cost of a gank Typhoon would be much greater than the cost of my Invincible Stabber. Suddenly, Kaldar was joined by Jennifer, who was flying an Armageddon. If another assassination plot was in the offing, it was one born of madness. With tech II fittings, they would sacrifice hundreds of millions of isk to destroy a ship worth but a fraction of the amount. And yet, having failed to kill me with their previous gank ships--despite doing the math in advance, one supposes--perhaps they felt it was the only way to bring enough DPS. It began. 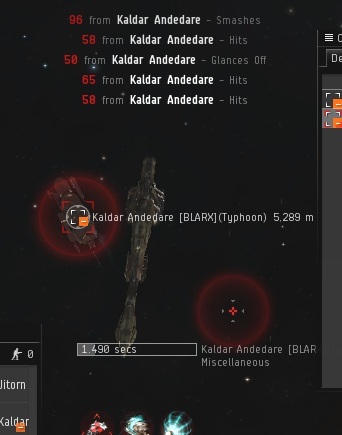 Kaldar threw considerations of isk out the window and opened fire. With no possibility of a positive isk ratio gank, the assassins threw themselves into one last desperate gamble, fielding gank battleships in an attempt to prove that my Invincible Stabber was not Invincible. After more than a year of bumping, had the Invincible Stabber finally met its match? I know what happened...the gankers all lost their ships in balls of fire and caused no damamge at all to the stabber. Cruise missiles or torpedoes seem like a poor choice for a high sec gank attempt against the Invincible Stabber. I wonder if Kaldar even got James down to armor. Didn't she hold her fire last time too? Like, she waited until the Concord her partners had just summoned were freed up and she died instantly. The target paint and web though are a step in the right direction. The endless torrent of stupidity displayed on this site on a daily basis is just too much. With each post, the temptation to re-sub, vacate my comfy corner of low-sec, and move to the wonderland of hi-sec grows. OH YES, GLORIOUS DELISHUSH CONTENT! MMMHHHHHHHHH, I CAN TASTE THE DESPAIR! TEHEHEHEHEHE, IT TASTE OF LE CINNAMIN! Because...because.....using not one but TWO battleships to try and gank a cruiser shows how....um....'leet'....you are. Tehehehe, did he use thermal rockets as well? Tehehehe! I can't wait for the conclusion! My money is on the invincible stabber, tehehehe, remaining invincible! I don't think it's coincidence that the stupid hate the New Order while the smart embrace it. I see a pattern! Oh wow, didn't expect him to open fire.... Good on him for his stupidity. Seems the treasury is down to 4 billion. 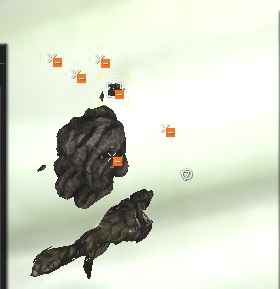 Oh how the ISK is slowly disappearing, not being replenished fast enough. Clearly this spells the end for the New Order. Go home you lot, show's over. Oh my god only 4 billion!! How many catalysts can you buy with 4 billion ISK? James reimburses us 15M for a T2 loss, so 4.44B / 15M = 296 T2 Cats, and some agents are space rich enough to not even care about reimbursement. 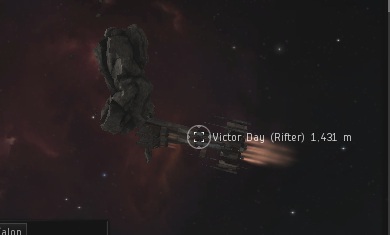 Anyway, I'm sure the good citizens of New Eden will step up to ensure miner tears keep flowing. wut? too bad dreads can't be used in hisec. gotta use bigger ships next time. and most amusing part - killing james 315 don't change anything. Jesus, they may as well bring out a strat cruiser or something already. 50 damage volleys mean he couldn't track you AND was shooting into your highest resist. Save the kill right for something special, you hear me? Those damage notifications are probably from his drones. ^^^ This. Tracking isn't really an issue with missiles. Then again, I'm assuming Kaldar actually took advantage of his ship's bonuses and used CMs or torps (especially since he has a painter), which I know isn't necessarily a correct assumption when dealing with carebears. Kamio is 0,7 security = Concord response time cca 10-12s when not lured away. It's hilarious how they try to get bigger and bigger ships because they can't find enough people out there willing to get in a catalyst fleet and gank James the proper way. James is loved by the High Sec community, a ganking fleet is impossible to form but I bet that an hugging fleet would get to one hundred ships in minutes! I'm having trouble locating this on killboard sites. Closest I can find is Jennifer and Kaldar killing a stabber with cruisers in July. Can someone link it? I'd hate to conclude that James 315 would just make something like this up. If James or no other player fired on Kaldar or Jennifer, there would be no loss mail. 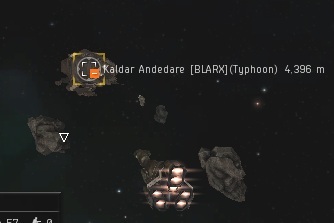 I'm going to go out on a very short limb and assume no player fired at Kaldar, and he was killed solely by Concord. I'll also assume Jennifer chickened out and didn't shoot.